The first recorded mention of the Château d’Orschwihr dates back to 1049. It is said that Pope Leon IX of Egusiheim was a guest when he consecrated the church of the neighboring village of Bergholtz-Zell. Rudolphe Habsuburg acquired the Château at the end of the XIIIth century. He later become Emperor of the Romans and founded the Habsburg dynasty that lasted until the early XXth century. Maximilian, another of the Habsuburg dynasty, sold the Château to the Bishop of Strasbourg in 1513, who later sold it to the local nobility but retained the vineyards. During the French Revolution the Château was seized and sold to non-nobles. The Hartmann family acquired the Château in 1854. It was an expensive residence to maintain and since 1789 it had changed hands several times owing to successive owners giving up and selling it on. At this time it was still surrounded by a moat, albeit empty, and was only accessible by one narrow bridge. The family turned the property into a farm, demolished the western walls, and filled in the moat on the westernside in order to provide more convenient access, building a barn on top in the process. In 1934 a fire lasting two days destroyed the Château entirely. It was partially rebuilt in 1936. Further construction was carried out in 1973 but only on the cellars and the barn was converted into a cellar in 1987 providing large under ground facilities that were again extended in 2001 with the construction of the western wing. 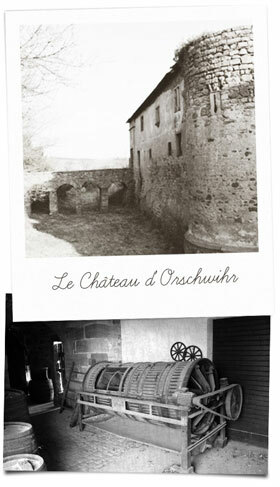 The first mention of the Château d’Orschwihr wines dates back to XVIth century and relates to the sale of a barrel of wine to the Murbach Abbey. However wine is known to have been produced in the area as far back as the Roman period. Between World War I and II some small shipments occurred, including some to Paris, but wine was mainly a pass time. Martin Hartmann turned the vineyards to commercial use in the 50s. His son, Hubert, took over in 1986 and increased the size of the vineyards from 6 to the present 25 hectares. Gautier is the latest in the family to continue the tradition and became responsible for running the family business after 5 years experience in 2011.